Posted 11/13/2017 1:52pm by Jennifer Syme. "New England is no stranger to the farm-to-table movement, a full-circle food philosophy boasting locally sourced, sustainable ingredients. The concept encourages you to “know your farmer” and understand the journey of your food, which is ideally just a short jaunt away. In the upswing of summer, this authentic experience is particularly accessible, as if the warm breeze provides a seemingly endless bounty of local food. Comparably, Syme Family Farm is bringing this same freshness from the field to local tables, but in flaming variations of fresh farm flowers – and so much more. Off the two-lane stretch of Windsorville Road in the rural respite of Broad Brook, over fifty varieties of vibrant flowers contrast horizontal slats of a pastel-grey post and beam barn. In the distance, Jen Syme – who owns the farm with her husband Bill – stands in a row of waist-high snapdragons. With swift precision, she cuts the long-stemmed perennials before moving onto an adjacent row of asters. As a full-time grower, this is Jen’s office, one she and her family began building some twenty years ago. Both her and Bill grew up in family farming and participated in 4-H, Jen on her family’s hay farm in North Branford, and Bill working at Dzen Tree Farm and in the agricultural science program at Rockville High School. As part of a Supervised Agriculture Experience Program he grew mums – 5,000 of them – you could say that was the beginning. After high school they attended the University of Connecticut, both receiving a Bachelor’s in Horticulture; additionally, Bill earned a Master’s degree in Agronomy. “We first met at a UConn Dairy Club meeting and fell in love over agriculture, as crazy as that sounds,” Jen laughs. The two lived in New Jersey for a short stint before Bill’s managerial position at Crop Production Services - a global agricultural product, service, and solutions company – brought them to Broad Brook. 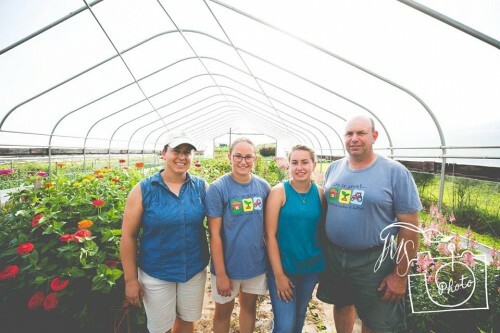 They began planting and growing on the property, simultaneously inspiring the same love for agriculture in their daughters, Emily and Becca. Even though the farm operates as a three-season business, the work – like any farm – is a year-round initiative. Since a majority of what they grow begins from seed, the Symes start preparing the greenhouses in February, planting a variety of spring products like herbs, vegetables, hanging baskets, and bedding and patio plants. As the warm summer months draw near, their focus is on cut flowers, which Jen began about 12 years ago. In autumn, their attention turns to over fifty varieties of mums, gourds and pumpkins. As harvest wanes, sales of U-cut trees, wreaths, swag and cemetery boxes begin – their newest endeavor inspired by Bill’s previous work and enjoyment on the tree farm. But for today Jen’s focus is on her flowers as she prepares for the farm’s sixty-member CSA (Community Supported Agriculture) pickup. For eight weeks, July – August, the Symes run a “Cut Flower Club,” offering a variety of both field and greenhouse-grown flowers. Each bouquet consists of sunflowers, zinnias, asters, snapdragons, lisianthus, rudbeckia, sweet william and much more. The rustic-inspired bouquets are just stunning and also available to non-members at their self-serve farmstand as well as the South Windsor and Collinsville Farmers’ Markets. Over the years the cut flower business has blossomed, actualized in Jen’s annual and exorbitant seed order. For example, she plants over 10,000 sunflower seeds throughout the season (about 600 each week from April – September), offers over 18 varieties of celosia flowers, grows 3,000 – 4,000 lisianthus flowers, and last month reported picking over 1,100 stems of snapdragons within just a few days. The “growing” business is attributed to customers seeking native, sustainable alternatives – similar to the local food movement. Foreign importers typically dominate the flower market – up to 80 percent – with countries like Colombia, Ecuador, and Holland being top producers. To make the journey, imported flowers are [often] fumigated and sprayed with chemicals to ensure “freshness” and color retention. Maybe that’s why Syme’s flowers smell so sweet, each is purposely harvested at its prime and is intended for a new home that same day. While their farm is ever evolving to meet demands and trends of a changing market, their love of agriculture never shifts. The entire family is heavily involved in local farming and as fourth-generation 4-Hers, Jen says she couldn’t be more proud of her daughters. 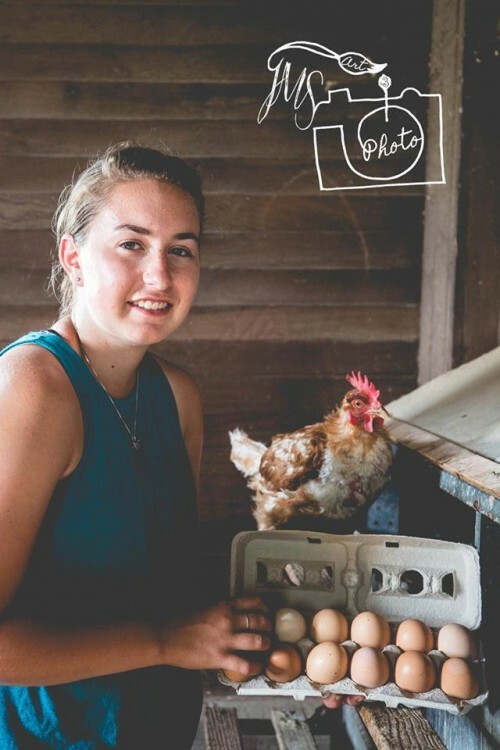 Both Emily and Becca also have their stake in the farm, caring for a flock of laying hens. Similar to Jen’s flowers, the two work together to sell fresh, laid-that-morning eggs in the farmstand. They are up before dawn, collecting and caring for the flock. Each has their interests, Emily is a huge proponent of the flower and cut flower program, as well as active in FFA and 4-H, serving as 1st Vice President. She’s currently working on building her dairy herd and her heifer is due this December. She was also “bit by the giant pumpkin bug,” her largest weighing in at 669 lbs. Becca helps her father with the Christmas trees, but has shown a greater interest in animals and is working on growing her herd of beef cows (both girls purchased their first cow with money raised from egg sales). 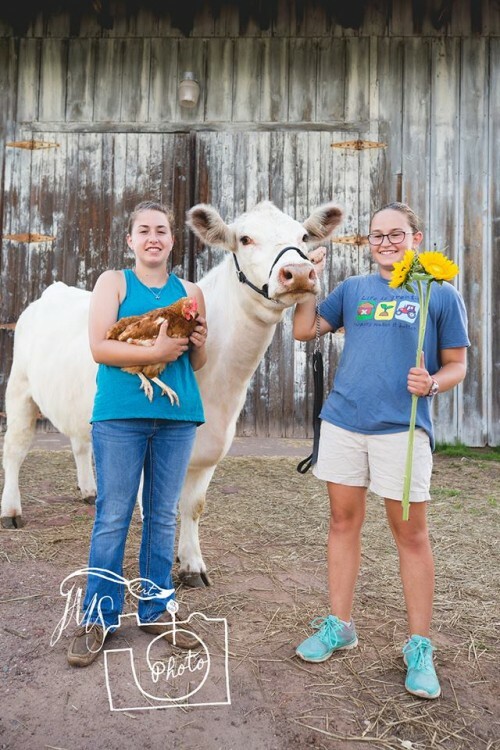 As an active member of Hartford County 4-H, she’s the Fundraising Committee Chair and has several projects – including poultry, dairy and beef – that she’ll be showing at the Hartford County 4-H Fair this month in Somers. Emily will also be at the August 18-19 fair, exhibiting her dairy cattle, poultry, flowers and vegetables. Bill and Jen are both co-leaders of the Merry Mooers, a 4-H dairy club based at The Collins Creamery in Enfield. With seven other leaders, they oversee the animal lease program, an opportunity for 4-Hers to develop skills and knowledge related to animal science, management, marketing, and the use of animals and their products. Each student member is responsible for training and care while keeping meticulous records required for exhibitions at annual youth shows and competitions. The Symes are a happy farm family, a vibrant patch on the quilt of local agriculture. It’s without question the life of a farmer directly correlates with hard work, but Jen says the task is made easier by a supportive agricultural community - all working together to prosper. Farmers can be decisively independent, but with a firm understanding that nothing is accomplished alone. Whether it’s the exchange of information, physical labor or even equipment, there’s a deep interconnectedness among our local producers - one as consumers we are lucky to have exist. Despite around-the-clock care a farm demands and the double edge sword of Mother Nature, in the end, the Symes are thankful they’re able to pursue their passions while raising two great kids in the outdoors. “It’s the little things you see - a dragonfly on the flower or a beautiful sunset - sometimes I have to pinch myself,” Jen says as she returns to her patch of asters. “It’s work, but when I stop to look and appreciate what’s around me...I’m fortunate, very fortunate.”"